Looking For The Best Routers For Lag-Free Gaming? We Can Help! If you are looking to setup a state-of-the-art gaming system, one of the most important pieces of equipment you can buy is a high-quality gaming router. To help you with this task, below we have reviewed several of the hottest and most popular gaming routers on the market today (according to our editors) and highlighted the advantages and drawbacks associated with each of these products. We have also included a Gaming Router Buying Guide, in which we have combed through some of the most important factors and questions you should consider prior to making a final buying decision. The ASUS RT-AC88U Dual-Band Gaming Router is one of the finest gaming routers on the market today, with some of the most gamer-friendly firmware money can buy. Among other features, the router boasts both a 2.0 and 3.0 USB Port which together supply up to 110 MB per second of bandwidth; a fast dual-core CPU; and a 4T x 4R antenna cluster that provides two constant high speed wireless streams. The ASUS company has integrated gaming oriented QoS and WTFAst WAN clients right into the router OS, which means there is never a need for you to install helper apps on the desktop. The ASUS RT-AC88U Dual-Band Gaming Router features Anti-malware services from TrendMicro, which are similarly integrated into the firmware. When activated, these services can independently survey and protect the local network and its clients. Many ports. The ASUS RT-AC88U Dual-Band Gaming Router features an eight port Local Area Network with link aggregation. Fast transfers. Boasting super high speeds, the router offers incredibly fast wireless transfers. Great firmware. The firmware on the ASUS RT-AC88U Dual-Band Gaming Router is very gamer-friendly. Premium Priced. The ASUS RT-AC88U Dual-Band Gaming Router is not a budget router by any means, and thus may not appeal to the budget conscious. Needs testing. The new hardware on this router may require testing. Only dual-band. 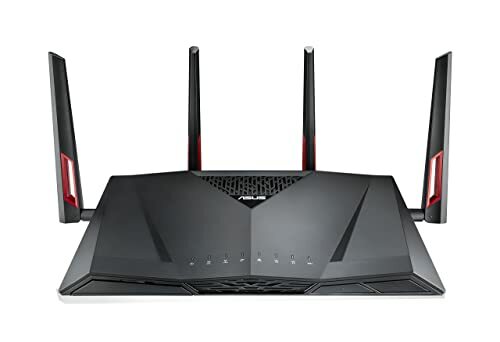 Instead of the latest tri-band operation, the ASUS RT-AC88U Dual-Band Gaming Router only has the older dual band frequency. 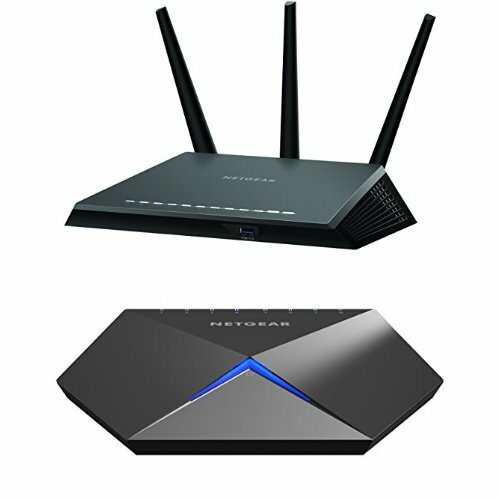 Made by a company with a long history in the wireless technology industry, the Netgear R7000 Gaming Router boasts a 1 GHz dual-core processor and AC 1900 Wi-Fi capability through its 802.11ac dual-band system. The router’s dynamic Quality of Service (QoS) helps it prioritize bandwidth by application and device, providing gamers with the fastest and most interruption-free streaming experience possible. The Beamforming in this device improves its range and performance, and high-powered amplifiers and antennas go a long way towards extending your coverage area via Wi-Fi. The Netgear R7000 Gaming Router works effortlessly with Amazon Alexa and Google Assistant, allowing you to control your home and gaming network using voice commands. System requirements for this router include Microsoft internet Explorer 5.0, Firefox 2.0, Safari 1.4 or Google Chrome 11.0 or higher. For families with small children, the router includes Circle with Disney smart parental controls that help parents manage their children’s online activity. Long range. 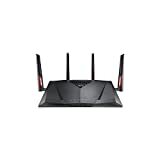 In this mid-range category of wireless gaming routers, the Netgear R7000 Gaming Router has by far the longest range. Dual-Core CPU. The design of the Netgear R7000 Gaming Router includes a 1 GHz dual-core processor. Stability problems. When used with older firmware, the Netgear R7000 Gaming Router may encounter stability problems. Not game-oriented. Unlike the previous router, which was specifically geared towards gamers, the Netgear R7000 Gaming Router is more of a general router. 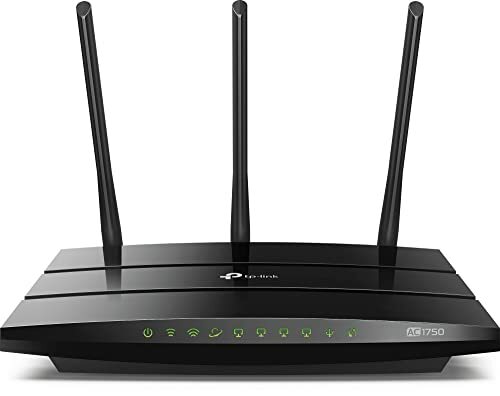 Geared toward beginners with a budget-friendly price, the TP-LINK Archer C7 AC1750 Router is equipped with the next generation Wi-Fi standard—802.11ac, which offers speeds that are three times greater than wireless N speeds and delivers a combined wireless data transfer rate of up to 1.75 GB per second. Boasting 1300 MB per second wireless speeds over the ultra clear 5GHz band and 450 MBps over the 2.4GHz band, the TP-LINK Archer C7 AC1750 Router is one of the best choices on the market for seamless HD streaming, online gaming and other online tasks that require a lot of bandwidth. Because the TP-LINK Archer C7 AC1750 Router operates on both the 2.4Ghz and 5Ghz bands, users can expect amazing wireless performance. This simultaneous band sharing offers you the flexibility of two dedicated networks—with multiple times the bandwidth for all your online needs. Budget-friendly. The TP-LINK Archer C7 AC1750 Router is by far the most budget-friendly router on our list of products. Great speed for the money. Thanks to the 802.11ac Wi-Fi standard on this router, users can expect remarkable speed for the price. Great aesthetics. The clever robotic styling of the TP-LINK Archer C7 AC1750 Router not only makes it perform amazingly, it also looks great on any gaming desk. No 3.0 ports. The TP-LINK Archer C7 AC1750 Router lacks the faster USB 3.0 ports that are found on our other two options. Minimal firmware. The minimal firmware on this router leaves gamers with little wiggle room. If you are in the market for a high quality gaming router, there are several factors and questions you should consider before making a final purchasing decision. Below we have outlined some of these considerations to help you find the perfect gaming router for your system. 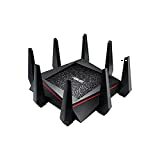 If you shop for gaming routers in this day and age, there are two standards now available in terms of Wi-Fi technology: 802.11n and 802.11ac. Both of these Wi-Fi standards offer speeds much greater than routers of old, but if you really want a connection with no buffering or drops, we highly recommend you go with the 802.11ac standard, with speeds up to 1300 MBps, which is three times faster than the 450 MBps you would achieve with 802.11n. When a network cable is plugged into a Wi-Fi router, the radio waves from that Internet signal are transmitted from either a 2.4 GHz frequency or a 5 GHz frequency—these frequencies are known as bands. Aside from providing better speeds, the 5 GHZ band also saves your device from outside interference. Most Wi-Fi-run devices still use the old 2.4 GHz frequency band, which can cause a lot of interference. Going with a 5GHz band instead will solve most of those problems. Perhaps the most important characteristic of wireless routers is their ability to pick up a range of signals. Naturally, a device that can pick up more signals is going to run smoother and faster than one that only picks up a few. This is why you need dual-band connectivity. 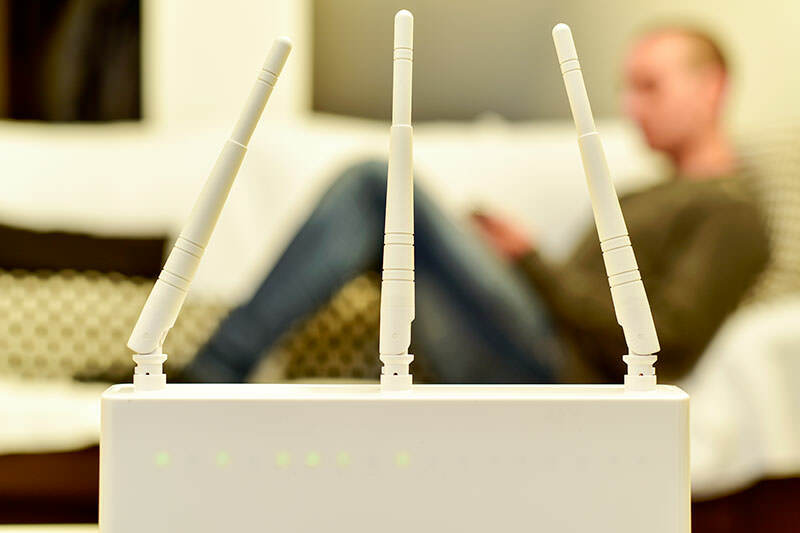 As the name suggests, wireless routers with dual-band connectivity are able to operate on two bands: 2.5GHz and 5Ghz. This is a big difference from the old wireless routers that only operated on the 2.5Ghz band. Wireless routers with dual-band connectivity can connect to both bands. As a result, it can sense signals from both bands, and then choose the one which offers the least resistance. This reduced resistance will lead to greater signal strength and a faster overall device. When you purchase a new wireless gaming router today, that router will have firmware built into its memory. This is important, because whenever that router becomes susceptible to attack, the firmware allows the manufacturer to release an update or patch to close the vulnerable loophole. However, as your gaming router gets older, and as new and better wireless routers are released, there is a chance the manufacturer may stop supporting your router with automatic updates. For this reason, you should look for one with Open Source Firmware. With open source firmware you will no longer need to rely on the manufacturer for updates. Instead, you can pursue your own patches from the marketplace. If you do not want to visit the manufacturer’s website for your gaming router every time you want to make changes to your account—change password, update information, etc.—you should look for a router with Smartphone integration. Many of the routers of today offer integration with iOS and Android platforms, making it easy to make changes to your account on the fly. If you have an older router, you may have noticed that certain websites open much faster than others when surfing online. The reason for this discrepancy is known as Quality of Service, or QoS. Routers that have QoS are able to prioritize critical data over the less important traffic. For example, if you are playing a complicated video online via your QoS gaming router, while also surfing the net, your router will prioritize the video game over the latter because that video game requires an uninterrupted flow of data and more bandwidth. Last but not least, when buying any electronic product, including wireless gaming routers, it is crucial you look for one that has a solid warranty. A good warranty usually indicates the confidence a manufacturer has in their product, while a short and very limited warranty may be a sign to steer clear of that product.